a large version of their harvester cell. Imagine being stuck in your car with your phone for a long drive without your charger. If you’re anything like me, you’d switch your phone off to save the precious battery for emergencies. Then, you’d probably have to head to a store when you get to your destination to pick up a spare. It’s a pretty common problem – one that a pair of engineering students may be soon making obsolete. 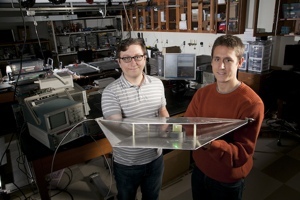 Duke Pratt School of Engineering students Alexander Katko and Allen Hawkes have designed a device capable of picking up WiFi signals and converting them to usable electrical current. Who needs a power cable when power-filled waves are all around you? The specifics behind the Duke technology are a bit complex, even for me. But the gist of it is that the students designed a high-efficiency device capable of devouring the power hidden in the invisible waves of energy around us. A small five-cell array was able to pull 7 volts of power from microwaves in thin air – enough to power a small USB device. Want more power? No problem: Increasing the amount of usable electricity drawn is as simple as adding another cell to the array. One of the most exciting aspects of this technology, aside from the convenience, is its green angle. Essentially, Katko and Hawkes’ device is recovering already spent energy that would otherwise be wasted. And given its high rate of efficiency – 37% -- we could soon see appliances designed to recapture their own energy. We’ll all be saving money while helping save the Earth. Very cool. For more on the Duke technology, check out the school’s blog. You may also want to take a look at these other cool gadgets that can help you save energy right now.